The ingredients were ripe on Saturday 19th July for that rare visitor to the Uk namely a Discrete Supercell somewhere in an area between Central Southern England and North East England. Early chase targets were Oxford and Leicester and both these places would see some action by the end of the day. Unfortunately due to a prior engagement (Storm Chasers BBQ In Wales) which was kind of ironic I could not chase this day but was pleased both targets verified. Temperatures of 84f and Dewpoints of 68f with SE Surface winds and 40kts of Deep Layer Shear and with a surface low pressure heading North from North West France set the stage for this event to occur, if clearing from overnight storms could occur then it surely would be game on. At about 4pm a storm fired near Chippenham and tracked just to the east of Swindon, here the storm turned right and became supercellular moving east towards the northern home counties, the largest hail I could find with this storm was just under golfball and pictures from other chasers showed this to be a stunning Classic Supercell when pictured just South East of Oxford. Other people said the anvil was impressive from North London, the Midlands and the West Country which shows this supercell must have been quite some height. The other storm of note was in the Leicestershire area where a funnel cloud was reported, although I am pretty sure this was not a supercell it was also a very severe storm for Uk standards. The next event in this 4 day sequence was a Convergence Zone event which initiated over Leigh On Sea in my absense and dumped 4" of rain in 2 and a half hours including hail and frequent CG Lightning, lots of damage to roads with manhole covers lifting and tarmac also getting damaged and bridges washed away in the Battlesbridge area, Canvey Island also suffered with extensive flooding of most roads. After thursday night and friday mornings elevated storms had cleared out of the way more humid and unstable air was being pushed north ahead of a shortwave trough which was still west of the London area. Once again storms initiated over Northern France and started to move north into the clear skies over South East England, again temperatures were into the low 90's and dewpoints into the low 70's would set the stage for another round or two of storms moving north. Estofex had issued a rare Level 3 over Northern France and indeed issued a special MD In the early evening for possible Supercells and a probable Bow Echo to move north over the English Channel into South East England in the early evening hours. I noticed some intense storms making landfall around Hastings that had initiated in the Reuens area of France and plotted an intercept along the South East Essex coastline around 9pm. I drove 3 miles from my house to Leigh Cliffs and once we got there an amazing shelf cloud was sitting in front of us looking south over the estuary towards Kent. This shelf I would later learn was nothing on the scale of what is was along the South Coast a few hours earlier, once again very clear CG Lightning was striking probably around 4 strikes per minute this time as the storm seemed to be losing intensity as it was travellng north. Unlucky shooting positions and having to move because of rain hitting our location with no cover meant only a few Cg shots were caught tonight, but a beautiful shelf cloud and structure was also photographed so was happy with that. Another MCS Storm system moved over the area between 3am and 6am on Saturday morning but this mainly consisted of IC Lightning but the intensity was right up there with some of the displays we used to get in the 1980's and 1990's. A welcome return ? Lets hope this becomes the norm again! Last day of our 2014 chase season in the states and fittingly a local chase near the Denver area to finish us off nicely, this is why we switch the last hub airport further north and west away from DFW Later in the season. Started today in Sterling with a chase target nearly identical to mondays risk, so we headed west towards Greeley and it wasnt long before another Supercell erupted south-west of Cheyenne and meandered off the front range of the Rockies, the thing that was different today was the storms actually moved North-East when they should have been moving South-East in the North-West flow, so after watching some Cg lightning south of Cheyenne off we went Northwards to chase this little LP Supercell that was starting to spit our 2-3" Hailstones. We took Highway 87 North -East towards Torrington and caught up with the cell from the west side running into numerous drifts of hail along the way, the biggest stones we found were 2.25" and had some pictures done with these, as it was getting later in the day some really nice hailbows were presenting themselves on the backside of the storm along with some hailfog. The storm started to fade as diurnal heating was reducing so we headed back to stay the night at Cheyenne which had us perfectly placed for the 100 miles drive back to DIA The next day for the guys with early flights. 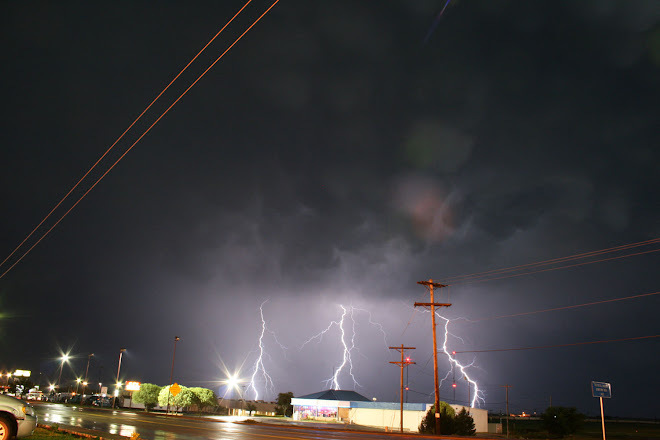 This was a nice end to the tour season and a record breaking one at that for me, with 27 Tornadoes and first time tornadoes in New Mexico and South Dakota as well. With the last 2 days of our season in the States looking like Easterly upslope flow days we made our way back from South Dakota towards Colorado on the Sunday, and so we started in Big Spring on this monday and headed westbound along Interstate 80 and then into Interstate 76 into Colorado. Storms were starting to form around the Denver area and also to the South West of Cheyenne along the front range of the rockies. One particular south east moving caught our eyes heading towards Greeley and it was this storm that we started to chase, when we closed to around 15 miles away a very nice LP Supercell was in front of us so we stopped for some pictures. About the same time storms were starting to erupt to our South East as well so we were getting surrounded quite quickly with numerous storms. Some pictures of the pretty Supercell structures on offer today. Started the day in Watertown and had a broad target are of around the Pierre area in Central South Dakota. Storms would fire on an SW-NE Cold Front today in broken line segments so the plan was to get on them early and hope they could stay semi discrete before lining out later in the afternoon. It wasnt long before our target storm was coming into view to our North-West north of Pierre, this storm was initially moving North-East towards the North Dakota border but soon turned right (east) and got tornado warned. The first glimpse of the Supercell showed us a very nice Classic Supercell with non rotating wall-cloud. We stopped and shot some pictures and then re-located east to the town of Bowdle. After this more storms started to fire and our storm went very outflow dominant, we pressed on east to Ipswich and then south towards Redfield, by now numerous storms had erupted in South-West South Dakota and everything was very messy, we took the decision to ride a few of the storms out before heading south to Mitchell for the night, just before nightfall one of the storms became tornado warned and we had tornado sirens blaring away in the farming community of Orient, we shot south to outrun the storm trying to get a glimpse back into the base but by now these storms were way to heavily laden with precip so any circulation would be rain wrapped. Travel day on the 22nd before the last few days of action in the Colorado/Wyoming areas. Picture of the Supercell looming over Bowdle Below. We left Huron around 11am and headed for Watertown for lunch, we noticed some towers along a stationery boundary to our north before we went into eat and by the time we had finished and came out from lunch these were looking much more robust with an explosive updraught in the distance. We shot north on the Interstate towards North Dakota and crossed into that state, by now our fledgling storm was a full LP Supercell by now to our North East, approaching these from the west is always a joy with some amazing updraughts powering up. We got south of the storm whilst it was tornado warned but never saw anything other than very weak rotation, we kept following it east and south east towards Central Minnesota but I always had 1 eye on tomorrow's much better risk back west in Central South Dakota so when we were confident enough this storm was not going to produce we left it and headed back to stay the night in Watertown on the Minnesota and South Dakota border. Once again I thouroughly enjoyed chasing in Minnesota, the lakes were not a problem and the chase terrain at times was fantastic. Some Pictures of the Backside of the LP And as it was moving east towards Wisconsin. We awoke in Sioux City (Iowa) on this day to a broad 10% Tornado Risk from South Western South Dakota all the way across to Northern Iowa and Minnesota to the east and Nebraska to the South. A Stalled Low Pressure area over Central Nebraska and a Stationery Frontal Boundary from that low pressure draped east north eastwards along with a Pacific Cold Front further west over West Central South Dakota would be the focus for thunderstorm initiation today. My initial target was near the Chamberlain area of South Dakota along Interstate 90 and with good road options in every direction, I also chose this target as it would allow us to be bang smack in the centre of both risks areas, the Low Pressure was expected to travel northwards to be near Mitchell by 00z. We left Sioux City and grabbed some lunch and proceeded westbound stopping at a rest area just west of Mitchell, temperatures were now into the low 90's with dewpoints into the mid 70's - The Cold Front had already fired a line of storms that were travelling Northwards about 75 miles to our North West and we could see the anvils from these from our location. After chatting with Dave Ewoldt he sent me some invaluable surface charts that were showing the LP To be sat to my North West within the hour and with a wrap of 76f dewpoints wrapping into the north east side of the low pressure, the tail end charlie storm along the cold front was getting very close to that bullseye target I had been sent by Dave and he even sent the name of the Town that would be in the bullseye called "Wessington Springs" I also started to note the bottom storm was now not moving north anymore and was anchored about 20 miles to our North, at about this time a further complication happened with a storm firing on the boundary to our south in the warm sector, decisions decisions ? The decision was taken away in an instant though when the next radar scan showed our Supercell to the north do a massive right turn and subsequently become tornado warned in an instant, we shot off north and our road took us perfectly upto the Storm South West of Wessington Springs, the chase was on. Our First look at the Supercell put us in front of a rotating Wall cloud near Crow Lake and it wasnt long before a Multi Vortex Tornado was a few miles in front of us touching down every few seconds into differing shapes of Tornadoes, picture below. Once again we were looking at an incredible Tornado underneath a classic looking collar cloud just like the 16th and 17th days just gone by. Todays storm was harder to chase but much more fun along dirt roads that were gridded every mile, we headed south after the above picture was taken and then east by about 5 miles just to keep in front of the storm, once again the Cg's raining down were some of the most impressive I have seen and a lot like the forward flank of the 16th June Storm near Pilger. After getting far enough in front we headed back North to be just South of the Town of Lane and South East of Wessington Springs, unbeknown to us at that time a rain wrapped wedge tornado was impacted the town, we could not see the tornado at all from our vantage point, but we were about to get in amongst more tornadoes from this storm as it was just starting to get going. We stopped at the Intersection of Highways 34 an 281 and noted some very strong rotation about 1 mile to our south, soon after a funnel started to descend from the wall cloud and we were moments away from our second tornado of the day, our position was firmly in the hook of this cyclic supercell but we were in the dry and had a very clear visual on this developing tornado so we had no cause to move, whilst this was occuring Wessington Springs about 3 miles to our West was taking a hit from the ongoing wedge. After this we positioned east about 1/2 mile as the above tornado was heading straight at us, this also allowed us to watch the tornado cross the road behind us at close range near the farming town of Lane. 2 Video Clips of this beautiful cone tornado crossing the road behind us at close range. As you can see from the above videos we did infact have 3 Tornadoes on the ground at the same time once again for the third day running, these cyclic Supercells really were very alike on all 3 chase days, the rope to our south was at one point spinning away in a field a few hundred yards showering us with leaves from the trees it had ripped up. When the Tornado had now cleared the road we went east a few miles then took dirt tracks north and back west to catch up with the now cylindrical white cone tornado heading to the west side of Huron, and unfortunately impacting the farming community of Alpena, it was a job to find good enough roads but we finally caught upto the tornado again and what a sight in front of us as we watched the last stages of the barrel cone and amazing rope out stage. Some Pictures from just South East of Alpena. Shortly after the above pictures were taken the tornado roped out and the supercell finally weakened, we headed back towards paved roads and stopped to take stock of the chase day all buzzing with excitement, I had finally bagged my first ever South Dakota Tornadoes and was pleased it was on such a great chase day, we were never in any danger the whole day with escape options and all vortexes were clearly visible all day except the Wessington Springs rain wrapped Wedge which we swerved. We headed to Huron for the night and ate Pizza takeaway whilst going through our pics and video. After yesterdays incredible season's best chase day we awoke in Columbus (Nebraska) with temperatures well into the 80's and dewpoints still around the mid 70's. A very volatile atmosphere was still in place and today's Set-Up reminded me somewhat like the Bennington day last year with a Stationery Boundary being the focus for storms, the secondary risk area was Western South Dakota into Montana but we were way off that risk zone for today so it was the Nebraska, Iowa and South Dakota risk area for us. SPC Had a broad 5% Tornado risk from Montana all the way across to Illinois through South Dakota, Nebraska and parts of Iowa and Minnesota, A huge area to pick a target from today, two seperate 10% Tornado risk areas were also noted over Montana and Iowa. With last years 28th May debacle still on my mind we made our way North towards the Nebraska and South Dakota border area near Vermillion and stopped for lunch, after this we headed back east towards Sioux City and an MD (Mesoscale Discussion) was issued for North Western Iowa and North Eastern Nebraska. Everything looked perfect once again "if" a Storm could break the cap. At 730pm an area of agitated Cumulus started getting it's act together back the way we had come from about 30 miles North of Norfolk, we were unfortunately the wrong side of the Missouri River and with only a few crossing points we took the decision to fill up the cars and get back across the River and back into Nebraska. There were about 6 areas of precipitation trying to organise and just like the 16th once these rooted into the boundary we knew it would be chase time, we got our first look at the Updraught as we headed South from Vermillion and an LP Supercell was clearly to our south-west, there was so much moisture though that the hazyness from about 15 miles away meant we really had to get in close or visibility would be an issue, the now Supercell was over my only south road option so I took the decision to punch through from the North-East side hoping any hail would not be too big, the other road option would have taken us a good 45 minutes longer having to go SE To Sioux City and then back South West. We entered the area of precip and only encountered sporadic very small hail and heavy rain and once we busted through this an incredible sight welcomed us to our west with a 1 Mile wide Wedge Tornado over open fields about 2 miles away, it was very close to the town of Coleridge on our Streets and Trips but was thankfully moving away towards the South. We stopped on a farm road and watched this stunning Tornado churn away with incredible structure and Collar cloud above the Tornado. Some Pictures of where we stopped just east of Coleridge. It was once again amazing to see such a large violent wedge tornado under an LP Supercell, shortly after the above pictures were taken the Tornado started to get completely wrapped in rain so we headed south towards Laurel and got onto Highway 20 which went east to west, we went west a few miles and could hear the roar and waterfall sound of the tornado to our North West but could not get a visual as it was still heavily rain wrapped, we then decided to go a few miles south to Laurel and watch the storm move towards us at about 5mph, darkness was now also starting to fall but this was just the start of this amazing cyclic Supercell and she had more tricks up her sleeve with another 5 Tornadoes still to come. The first of these was another wedge tornado with satelite stovepipe next to it on the ground at the same time, I got a decent Iphone picture of this as the lightning illuminated it. These tornadoes were now moving straight North again so we headed back to Highway 20 and watched from about a mile away, Tornado number 4 was a tall Stovepipe churning away to Tornado number 2's east, whilst this was going on amazingly another cone Tornado touched down about 5 miles further west, meaning we once again had 3 Tornadoes on the ground at the same time again, the radar appearance again was looking like the 16th June with seperate mesocyclones and continous development on the Supercells south-east side, with it being very dark it was starting to get tricky to stay out of harms way with touch downs happening everywhere. Some Video and a Picture of Tornadoes 2 and 4 in progress at the same time, when this picture was taken another cone tornado was ongoing off to the left of the picture to our North West. While Tornado Number 5 was brief the last Tornado we saw today was probably one of the prettiest and touched down while 2 other Tornadoes were still ongoing a few miles to our North, this tornado tocuhed down near Dixon and was a very pretty Stovepipe Tornado crossing the road to our east, we watched a few green power flashes as the tornado took out some powerlines down the road from us, so we now had 4 areas of interest from this amazing Supercell Thunderstorm. The above tornado was occuring right over our path east to Sioux City so we tentatively crept eastwards after the tornado had dissipated and got east of the storm a few miles to look back at the incredible structure to our west, some pretty amazing Cg Lightning was lighting up this stack of plates Supercell so we stopped and took it all in, to be honest you could have photographed this storm for hours without moving as one thing that struck me was the Storm moving 12 miles in 5 hours just stuck on a stationery boundary eating up all that shear and vorticity. Picture Below shows the Supercell's structure with insane Cg's that were raining down. We finally left the storm whilst chatting to some locals in a field and headed for Sioux City for the night, I was really pleased that I learnt from my mistakes from Stationery Boundary events from 2013 and nailed this Set-Up and Chase and we now had got 13 Tornadoes in Nebraska literally in the same area in 2 days, the season was well and truly looking up!! Started the day in Sioux City (Iowa) on the west side of the Missouri River. Today was one of the days I had been looking forward to for quite a few days, moisture had been put in place for quite a few days and expected dewpoints for today along the warm front should easily reach the mid 70f range. Overnight Elevated Storms were ongoing when we woke up and these were moving east towards Northern Iowa and Southern Minnesota, these storms would also be a vital cog in today's risk zone leaving an outflow boundary in their wake. Todays Set-Up was one that chasers drool about, A Stationery Warm Front somewhere just North of the Interstate 80 Corridoor and an Outflow Boundary draped from North Central Nebraska down towards the Omaha Area in SE Nebraska, 5,500jkg of Cape and expected temperatures of 85f with expected Dewpoints around 75-77f. Shear was abundant along the Warm Front and if a Storm could develop and stay discrete and ride the WF & Outflow Boundary we could be in for a Big Day. After heading away along Highway 20 from Sioux City my target area was starting to become very clear, ample clearing to the South West of the Overnight Complex near Grand Island had me leaning to on target area which was Norfolk (Nebraska). This would be within the Warm Front as it was lifting northwards and we even saw the Warm Front head North over that Town at about 2pm (CDT) Whilst having lunch. It was also be just in front of the Outflow Boundary draped just to it's east. At about 245pm the SPC Issued a PDS Tornado Watch and some showers were starting to get their act together near Ainsley, the first attempt at a storm lasted about 25 minutes before shedding it's anvil over Norfolk, then at about 3pm three seperate Updraughts exploded just North of Columbus and congealed into 1 large Supercell travelling towards Stanton. The Chase was firmly on and with a Storm initiating in the perfect spot for the Warm Front and Outflow Boundary I had a mixture of excitement and a daunting fear for what towns would lie in this Supercell's path. Off to the Southwest the First EF4 Tornado in progress was still visible before becoming rain wrapped North East of Stanton, but we had our first Tornado of the Day in the bag, albeit at a long distance but it was clear to see. We stayed at our position and watched as the Supercell occluded and a new strongly rotating wall cloud was coming into view and much closer to our position, the Storm was clearly riding the warm front now and was starting to head more ENE In direction. From the look of the wall cloud it was only a matter of time before another Tornado was about to touch down, we started taking some small hail but it was still the lightning that was the biggest danger, we were joined by a young lad who was the spotter with the volunteer fire service based at Pilger who asked us if the sirens needed to go on at Pilger and Wisner to which I shouted really sternly "YES Get them On and Keep them On" Around this time a few other chasers pulled up along this small road along with the Sherriff of Mason County who was looking very worried. About this time we also tweeted a picture of the developing tornado to NWS Omaha. Video Below shows the Sound of the Thunder as the Pilger (EF4) Tornado was just getting started. The next video shows the Tornado started to become a large cone Tornado East of Stanton and moving directly at Pilger, notice the local radio station in the car at about 1min 20 seconds saying if you are in Pilger take cover now as it will be expected at 415CDT, You can also hear the sirens from both Pilger and Wisner in the Video Clip. Just after the above picture was taken another wall cloud to the South of the picture above started to rotate violently and it was looking like another Tornado was going to form at any minute so I re-positioned us at this point about 2 miles further east and stopped once again. And it was a good job I did as what happened next had me open mouthed in amazement at what was unfolding before us, another Strong cone Tornado touched down at exactly the point where we were sitting and started churning it's way Northwards with the now Wedge still in progress some 2 miles to it's west, what was unfolding was a once in a lifetime chase event. Unbeknown to us in the picture below was the town of Pilger was taking a direct hit and unfortunately 2 lives would be claimed at about this point in proceedings. The other thing about this Supercell was the insane structure it had, with 2 clear Mesocyclones in the same storm system. We continued to watch open mouthed at what was happening a mile or so to our West feeling in awe at the power of nature at this point, a field of corn produced an amazing foreground to this pair of monster EF4 Wedges churning away Northbound. Some video and pictures below. A little after the last picture above the tornadoes seemed to crash into each other and became rain wrapped so we needed to head further north and follow the cyclic supercell in case more tornadoes formed, we took our road east for 5 miles and then headed north towards the town of Wakefield. It was becoming clear a new occlusion was occuring and we were again minutes from another very large wedge tornado forming, about 3 miles south of Wakefield the tornado touched down into a large wedge but once again another satelite tornado was observed to its south, this time the secondary tornado was much smaller than the previous twins and quickly skipped into the parent mesocyclone and dissipated, Wakefield was also spared a direct hit with this tornado staying over mainly open farmland and luckily destroying a few barns with no loss of life. This would become the Storms 4th EF4 Tornado of the Day. After watching this Tornado dissipate we pushed onwards towards the Town of Hubbard which had tornado sirens screaming out as we passed through, we carried on towards the town of Jackson and watching a spinning wall cloud above our heads on winding roads towards Sioux City, numerous funnel clouds were dancing around in front of us until finally we had our 7th Tornado of the day touch down north of Jackson near the Nature Reserve, this was a very brief tornado on the ground for no more than 2 minutes. This will rank as my New number 1 chasing day simply for the fact of seeing incredible events like 2 large violent EF4 Tornadoes in such close proximity being probably a once in a lifetime event, and seeing as the last time this happened was April 11th 1965 (Palm Sunday Outbreak) I doubt I will be around chasing when I am 91 years old if it is a 1:50 year event. Obviously the only downside to today was the loss of life, but with warning times around the 15 minute mark numerous lives were saved by chasers getting reports in early and people looking at social media, radio,tv stations etc and if we can keep the warning times to 15-20 minutes many more lives will be saved in the future.